Designed to treat acute and chronic, non-healing wounds, the Wound Healing Center is comprised of well trained wound care professionals including physician specialists, registered nurses, registered dietitian and support staff. 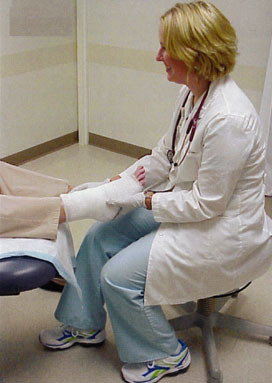 Our certified wound care experts have been helping to heal wounds in our communities since 2003. Our nurses are board certified by the Wound Ostomy Continence Nursing Certification Board, the National Alliance of Wound Care. This mark of excellence ensures that a nurse is knowledgeable and qualified to provide you with the right kind of care. It means we have gone the extra mile to specialize in the care of patients with wounds, ostomies, or continence disorders. The primary responsibilities of our nursing staff are to coordinate, evaluate, and direct patient care, consultations, staff and patient education, and to oversee maintenance of an evidence-based practice. Recommendations for care management are evidence-based, cost effective, and individualized for the specific patient situation. Mercer Health Staff works closely with your personal physician, just like any other medical specialist. We'll discuss your plan of care and provide updates regarding your progress while you continue to see your primary care physician for routine medical care. During the course of your treatment, our center will partner with your regular physician to assure complete continuity of all your medical needs.